Joaquin Phoenix's Joker trailer's subtle tribute to Heath Ledger. The subtle tribute to Heath Ledger in the new Joker movie trailer. Just months after he finished filming his performance as the Joker in The Dark Knight, Heath Ledger passed away. His performance, hailed as one of the greatest in cinematic history, would win him numerous posthumous awards including a Golden Globe, BAFTA Award and the Academy Award for Best Supporting Actor. So, there is no denying that the character of the Joker has become synonymous with Ledger. But he was not the first nor the last to play the Batman villain. A teaser trailer for upcoming film Joker was released by Warner Bros. today, giving fans a first look at Joaquin Phoenix’s portrayal of the DC Comics character. Check out the Joker trailer below. Post continues below video. And there’s one particular moment – right near the end – that fans are claiming as a Ledger tribute. 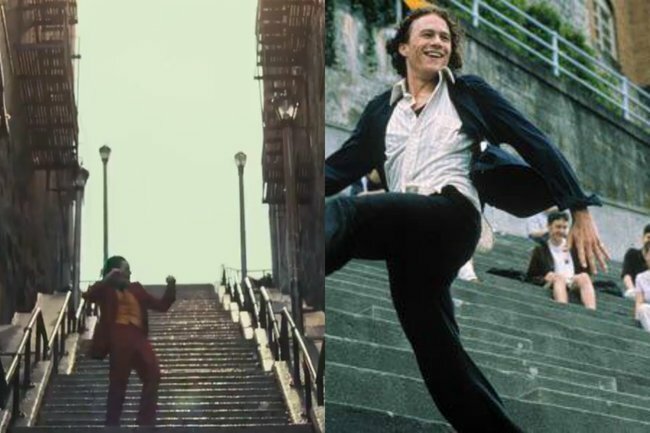 Phoenix’s Joker is seen singing and dancing on stairs, and it does look awfully like Ledger’s famous bleachers scene in 10 Things I Hate About You. Maybe it’s just a coincidence, but if not, it’s a very nice touch. Ledger and Phoenix were friends before the former’s death and before taking on the role, Phoenix said he would depict a Joker different from Ledger’s. “I think that genre, comic books, kind of lends itself to having different people play to same character and interpret it in a different way,” he told InsideWire in April 2018. Joker will be released in October.